SNOW BACK IN FORECAST: Cloudy for Wednesday and cold. Seems to be a reoccurring theme! A chance of snow flurries today before noon and a high of just 38°. Currently, it is 30° at 7 a.m. Tonight, cold and a slight chance of snow showers, low of 21. Sunshine returns for Thursday, Friday, Saturday, and Sunday with gradually warming temperatures. Highs from the upper 30's Thursday to upper 40's by Sunday. TORNADO SAFETY DAY: We have tips on tornado safety today at the Examiner page. Remember, this is Severe Weather Awareness Week in Tennessee. All of the information is available at the Nashville Weather Examiner page. 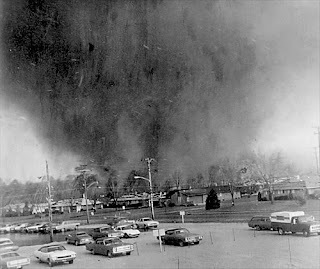 The picture, today, is of the famous 1974 Xenia tornado. The series of tornadoes that struck the U.S. on April 3rd and 4th was one of the most deadliest in history. Here in Cookeville, 11 people lost their lives out in the Poplar Grove/Dry Valley area. 1967 - Record lows for this date are set at both Nashville (10°) and Crossville (2°). Today's story is about tornado safety. Schools and businesses all across our state will have a tornado drill at 9 o'clock this morning.